Clearly Christmas: Operation Christmas Box. The thing that kicks us into Christmas Gear every year is Operation Christmas Box. Basically you take a shoebox, decorate it and then pack it full of goodies for a child who is not in a position to receive much more than the box you give it, for Christmas. Frankly my children have so very much in a country full of children who have quite literally nothing: we take a box per child and match them up by age and gender and then each of our kids gets to put in the box things they would like to receive. Things like little toys, beanie babies, little books, lots of stationary and stickers, and always a heap of school supplies, a juicy box, a few sweeties and so on. I would rather my kids focused their Christmas Gift Energy on these boxes than generating elaborate ideas for themselves – it has worked so far! If you live in Cape Town here are the details. The contact details are here and the closing date for this year is 23 November 2008. This is a project that is not unique to Cape Town. 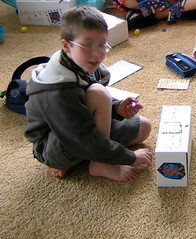 It runs under the banner of Operation Christmas Child in the UK, and Australia and Samaritan’s Purse World Wide. 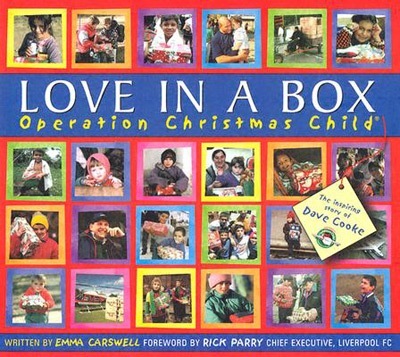 It is a mini coffee table book, packed with inspiring stories and photographs of children around the world benefiting from Operation Christmas Child. It is lovely and heartwarming. Really I think this is a project that you can do anywhere in the world. And it doesn’t matter if you have kids or not, if you are a grandparent or not. 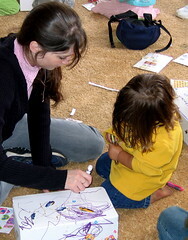 The only thing that matters, really, is if you want to make a difference in the life of a small child this Christmas. If your kids own half the world and you really want them to learn about giving rather than receiving… then here is a great opportunity for you! I challenge you to make a shoebox… If you cannot find a local Operation Christmas Child you will surely be able to find children less fortunate than your own. Donate to them. 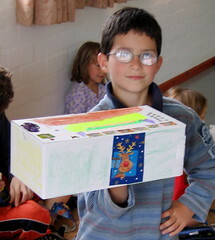 Make a shoebox with your kids, do it with a group of families and help spread a little love this year. Prev Clearly Christmas: How Se7en Do Christmas. just wanted to say that i’ve been reading your site for a few months now and that you and your family are a wonderful inspiration! have a most fantabulous week! Thank-you R, You are too kind yourself!!! I hope you have a great week as well!! !